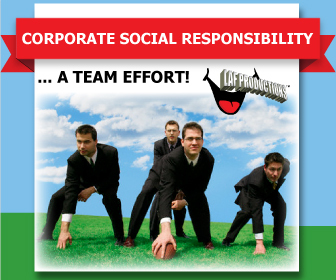 Community Projects | LAF Productions, Inc.
LAF Productions accepts and applies its corporate social responsibility within our community in a team fashion. As a consumer, you have the right and power to choose the company you keep, trust and spend your hard-earned money. 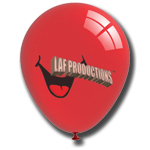 LAF Productions wins each time an additional consumer picks our products, services and/or training. Your decision to team up and redirect your spending from others to us, helps us reach and exceed fiscal goals. You benefit and win by getting quality products, services and/or training that's worth every penny. The community, in turn, now wins as we net financial gains and necessary resources that enable our initiatives to succeed, give back to and support the community and state that sustains our growth. Now, this is a game-changing strategy that leads to an all-around victory of team efforts. This is truly something to really get excited and cheer about because it is an overall win in the game of giving back and to pay it forward! Join our winning team today! Amidst our Global and National economic downturn, LAF Productions is both an accountable and committed partner in helping rebuild Arkansas and America's economies. Your voluntary donation helps support philanthropic and sponsorship endeavors like our education and health initiatives, of which, some are highlighted on our Community Projects page. Every donation dollar given that you specify for our Synergy Saturday | Health and Wealth Initiative will automatically enter you into our Drawing-for-Donations, only if you're a current Arkansas resident. For details of the annual drawing and its prizes, click here or the Synergy Saturday Donation | Retail Products tab. You can click PayPal Donate below to give your choice amount without placing an order or you can click our Donate button to add $5.00 to your existing order. Thanks for your in-kind support. 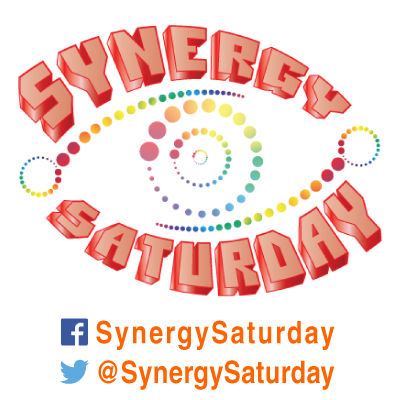 Synergy Saturday ... a synergistic day devoted to perfect health promotion and legacy wealth creation for life. As both a Wellness Project and Health Awareness Initiative, it is a real solution that provides real efforts to real problems of poverty and poor health. 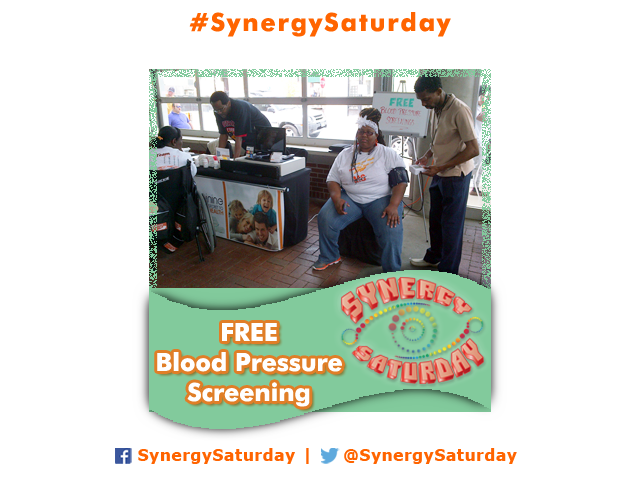 Synergy Saturday is a weekly wellness project and health awareness initiative with FREE health screenings, risk assessments, giveaways and health education handouts to reverse poor health and poverty. Poor health and poverty unfortunately go hand in hand; therefore, our health initiative targets both. 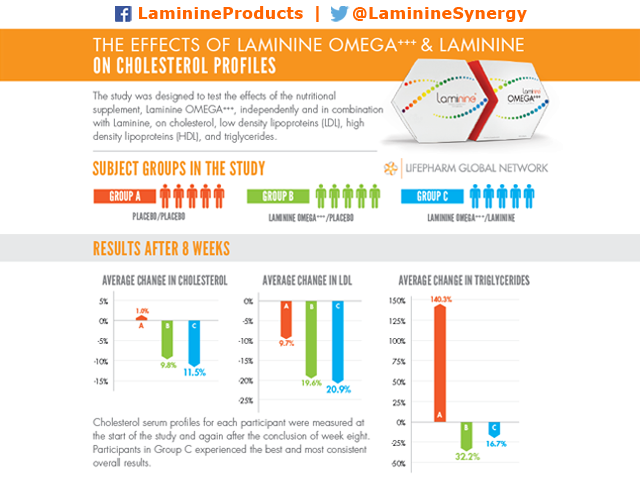 Equity stake in the American Dream creates a desire to oppose poor health to live longer. Synergy Saturday health initiative encourages participants to lead healthier, longer and more productive lives to build legacy wealth. Our areas of concern, care and welfare are: Cardiovascular (Heart), Circulatory, Digestive, Immune and Overall Health. Like us on Facebook, click here. 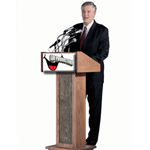 Educate Arkansas: 2 Create Entrepreneurs 2 Create Jobs 4 Arkansas is a FREE 20 hour training project of 20 randomly-selected business aspirants in Arkansas. It is also a documentary that captures the entrepreneurial journey from start-up to success of 20 randomly-selected business aspirants living in Arkansas. After the selection process is complete and we have chosen 20 aspirants, each participant will get enrolled into the same 20 hours of training sessions during the month of August. Then, we will track and document their progress from start-up to success for 6 months. The final edits will be completed and the DVD produced with a private screening celebration and showcase. For the chance of being selected as one of our 20 trainees and documentary subjects, click here. For detailed information regarding our ongoing Entrepreneurial Training and Development, click here. 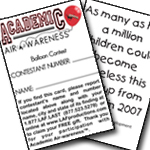 Academic Air-wareness™ is a balloon contest created to raise awareness for academic issues and needs that are present across American schools. Through its contest awarding, Academic Air-wareness restores communal hope for help and provides individual financial assistance for growing school expenses, which many school-age children face, but cannot afford. Balloon Launch Day - Participants with age ranges from kindergarten to high school donate $1 per entry card. Each participant’s first name only (security measure) is written on front of the entrant’s card along with a corresponding identification number and reporting instructions for those who find the card and/or deflated balloon. The back of the card bears an insightful statistic chosen for its relativity to American academic issues/needs, especially in this time of recession. After all entry cards are gathered, affixed to helium-filled balloons and given to contestants, a countdown will ensue for all balloons to be launched into the air simultaneously for their unchartered journeys. Balloon Tracking - The contest spans 45 days with tracking of reported balloons. 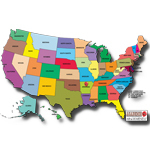 Once a balloon is found and reported, the entrant’s identification number is updated on the map spot of the official watch map for Academic Air-wareness™ on LAF Productions, Inc.’s website. The entrant’s balloon which travels the furthest distance and is officially reported wins! Announcement of Winners - Contest winners are announced and checks are presented. Sponsorship Commitment Form - if you were not mailed a sponsorship package and would like to become a sponsor, click the previous link to download the form and return it by fax or mail. Thanks. 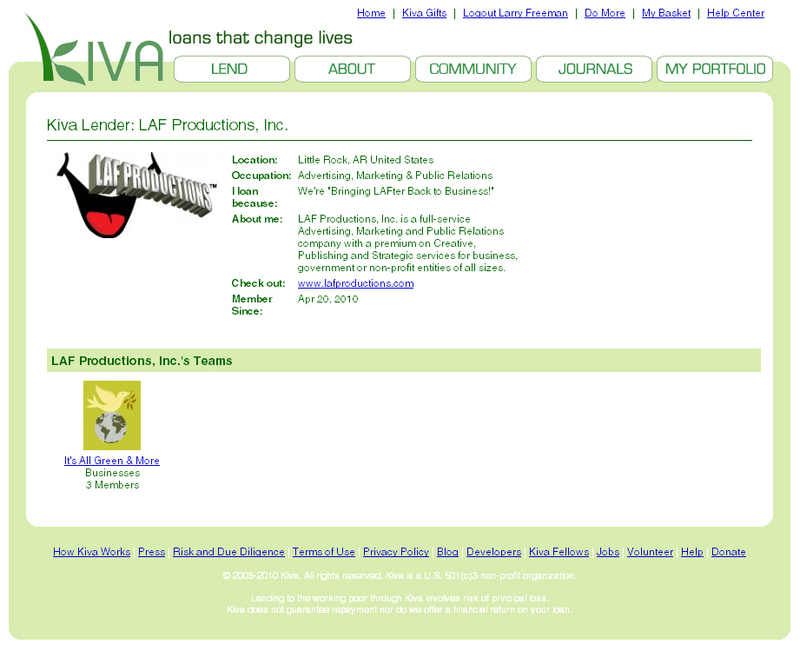 Kiva's mission is to connect people, through lending, for the sake of alleviating poverty. Kiva empowers individuals to lend to an entrepreneur across the globe. 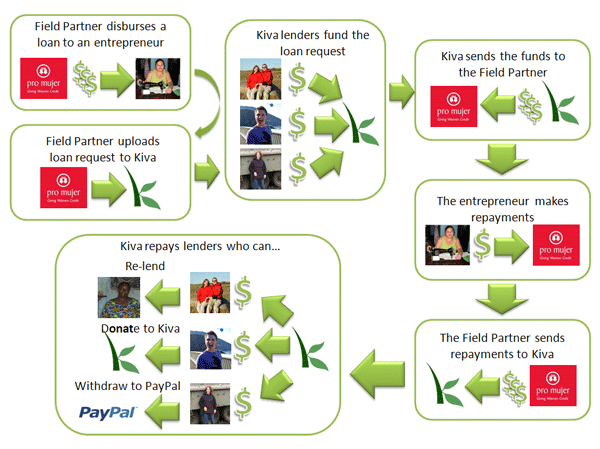 By combining microfinance with the Internet, Kiva is creating a global community of people connected through lending. People are by nature generous, and will help others if given the opportunity to do so in a transparent, accountable way. The poor are highly motivated and can be very successful when given an opportunity. By connecting people we can create relationships beyond financial transactions, and build a global community expressing support and encouragement of one another. Dignity: Kiva encourages partnership relationships as opposed to benefactor relationships. Partnership relationships are characterized by mutual dignity and respect. Accountability: Loans encourage more accountability than donations where repayment is not expected. Transparency: The Kiva website is an open platform where communication can flow freely around the world. "The beautiful thing about learning is nobody can take it away from you."